I have developed a bad habit of feeling regret and guilt. In many ways, these feelings are an inevitable side effect of motherhood. Two experiences that are impossible to imagine without the other. “Guilt” and “motherhood” are like hamburgers and French fries, peanut butter and jelly, autumn and falling leaves. Like everything else about parenthood, my personal experience of guilt and regret is different than what I expected. With each passing day I get less stressed out about the little things: the vegetables my son didn’t eat at lunch, the teeth my son didn’t brush at bedtime, the toys that never get put away in the living room, the laundry that piles up in the bedrooms, the floor that needs to be washed in the kitchen. Yesterday my son’s preschool teacher told me that my son needed to learn to use a regular cup, and apparently he’s the only kid in his class still using a sippy cup. I’m making half-hearted attempts to get him to use a cup, but I’m hardly stressed about it. A year ago I would have embarked on an intense “cup training” program so that my son wasn’t “behind” all his classmates. With each day the daily vicissitudes of parenthood feel a little less extreme. I’m gaining confidence that my son is a happy, healthy little person of his own, in many ways separate from me. As I gain perspective on the little things, I get increasingly stuck on the big questions of motherhood. Ten years from now, will my choices — to forgo a traditional academic career — still make sense? Will I regret not having more children? Should I have tried harder to pursue other career paths? Am I being brave to try freelance writing or not facing up to my fears of not competing as a traditional academic? Would my marriage become stronger over time if I worked full-time? After several years of absence from the work place — finishing my dissertation, having a baby, moving to a new city — will I always be “behind” my peers? A decade ago, when the original “Opt Out Generation” article by Judith Warner came out in the New York Times, I remember the media controversy and I had strong feelings about it. This would never be me. I would never sacrifice my earning potential and future career ambitions for the sake of being the primary caretaker of a child. My future husband and I would share equally in child care and household responsibilities. I was certain of that. A decade before that, I had written my undergraduate thesis on first-time motherhood. I interviewed women and couples before and after the birth of their first child, over the course of a year. With the exception of a few women, these were professional, suburban women in Connecticut. Every single one of the women in my study decided either before or after their babies were born to quit their jobs. I was horrified and analyzed my interview data through that lens: explaining why our society’s parenting decisions are so gendered. Now, if another 22 year old feminist college student from Wesleyan showed up at my door to interview me, a first-time mom, I’m pretty sure that she wouldn’t be able to distinguish me from any other mother in my study. What I heard instead were some regrets for what, in an ideal world, might have been — more time with their children combined with some sort of intellectually stimulating, respectably paying, advancement-permitting part-time work — but none for the high-powered professional lives that these women had led. This is what I want: my own career identity, without being crushed by professional demands. To contribute to my family financially. To share equally with my husband in the emotional and physical work of raising a child. To experience professional fulfillment and to know that I am using my talents and education. To have small daily moments with my son — reading our favorite books together on the couch, walking hand in hand to our neighborhood park, stopping to play with the train table in the library. Do these words — leaning in, opting out — have any meaning for you in your family and work life? Or do you think they might be media creations intended to make mothers feel guilty? Thank you to my FTSF hosts: Stephanie, Kristi, Kate, and Dawn! The media lives and dies by our emotional and fanatical responses to what they write. It only makes sense that they press our most potent and division building buttons. Leaning-in and opting out to me are just catch phrases they’ve put on things we’ve already been considering. My dalliance with opting out had way more to do with being forced to pump breast milk in a a unisex bathroom between the leisurely dumps the male sales reps would make, than it was about choosing kids over career. My leaning-in? I’m not so sure it fits the Sandberg definition, for me it’s definitely been about proselytizing that women can carve out something closer to the scenario that they want if they ask for it. Now I am rambling, ultimately what I am trying to say is that it’s all up to us, we have vastly more power than we think in that we can abandon guilt, we can double dutch our way in and out of our career, and we will all feel a tiny bit of what if no matter which path we choose. There is so much truth in the fact that the media creates “buzz” about certain cultural trends relating to women, and then plays that buzz — and the guilt that’s increasingly a part of modern parenthood — for all its worth. But I do think that often these media trends do reflect anxieties and inconsistencies that are genuinely present. But how much are they perpetuated by the media itself? Not sure. Great post! For me, I think that terms like “opt-out” and “lean-in” are media-friendly summaries of the actual complexity of our lives. We tend to look at our experiences in snapshots (and in the age of Instagram and Facebook, that’s even more literally true). There is so much finality implied when these decisions get discussed in public spheres. It’s as if this woman “leaned-in” and is now stuck in a perpetual forward motion while this one “opted-out” and can now never get back in the race. 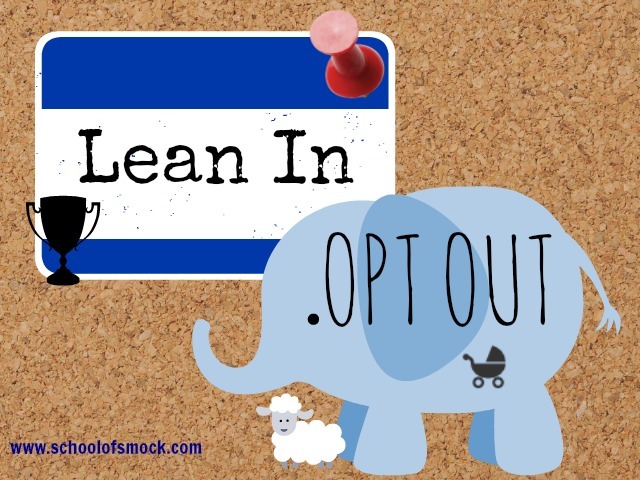 The truth, though, is that most of us both “lean-in” and “opt-out” on a daily basis, in ways that aren’t nearly as exciting or dramatic. It’s like being on a Tilt-a-Whirl, not a rocket ship. We move back and forth with the ebb and flow of our lives around us. That doesn’t mean that there aren’t consequences to these decisions, and–as you point out so well–there’s going to be guilt, but I don’t accept the notions of finality that get tied into these narratives. I too am uncomfortable by how these buzzwords are now cultural short-hands for women’s choices. And that is part of my story, I think. I don’t feel like I will ever fit into one of these scripts. I’m glad for that ultimately. Oh, boy. I could write so much about this. I opted out of practicing medicine when my first was born and had medical issues. I intended to get back into it when he was 6-12 months old…and then never did. What I would have loved was some way to combine both, but I don’t think even that is a perfect outcome in reality. That’s so interesting, Lisa! I would love to hear more about your story! There is so much wondering: about the other paths, about other lives, about how our kids might be different if we had made other choices. I do think that my choices were work out for me. It’s just difficult to be in a sort of “transitional” moment in your life. I think the media makes up feel guilty about our choices. Heck, I wrote a whole post about being a stay at home wife & then a stay at home mom & how I was always made to feel guilty about the former choice & not the latter. I really think it’s all society. I know all about opting out, too. Having been a teacher before having kids and then losing my position with cutbacks during my second pregnancy. I didn’t bother trying to go back, because at this point the positions are indeed scarce and I will not just substitute teach to pay for my kids daycare. I don’t see that as being worth it. But the media does put a lot of focus on us moms who choose to stay at home. Yes, i do feel guilty on a lot of levels and no that I do technically work at home, I feel guilty for so much of the time I spent on the computer indeed working and networking. I think there will always be some form of guilt we feel as moms. Really wonderful post and I thank you for linking this up with us today! Thank you, Lindsey! That means a lot. I like that idea of “leaning in” more or less. The media sort of presents it as a dichotomy: you’re either “leaning in” or you’re not. But life is much more complicated than that, as all of these women from the article and their experiences demonstrate. Articulate reflections. The media’s tendency is to posit things in black and white – opt out or opt in – but is so rarely like that. There are so many ways to work. Personally, I did not opt out (I am the sole breadwinner actually) but my career track is not what it would have been if I did not have three children. I felt guilt for a long time from all sides, but it has eased over time. Yes, I think that’s an important point that is missing from the headlines. None of these women are sorry that they left their corporate lives; they’re not wishing that they had decided to “lean in” before their children were born, in the traditional Sandberg sense. Oh Jessica. This is so perfect. I love reading a post that feels as if I wrote if myself if I had the brains and eloquence. It’s so interesting to observe how we do a 180 on our pre-kids expectations of ourselves and so strange to realize how non-original we are in doing this. I loved this sentence: “Like everything else about parenthood, my personal experience of guilt and regret is different than what I expected”. It’s so accurate. I observe myself as a mom and I am so frequently surprised watching myself function and react in ways that I could never have predicted. I think a lot of moms feel this guilt. If they work, then they are not spending enough quality time with their kids. If they don’t work, they are “opting out” and not contributing financially. I have struggled with this myself. I always intended to be a stay at home mom, but somewhere in there I lost the sense of my own identity. I think I am finally getting it back through blogging and re-focusing on some things I enjoy, but it has been a very long journey and I’m not quite to the finish line yet! First, I think it’s funny we are the same age, and Wesleyan was one of my final choices for college… how funny if we’d been in college together… Anyway, I feel like the media like to play up these stories about opting out, leaning etc., because they know all mommies are going to get riled up about their choices. For me, the choice to continue working full time was part financial, but mainly because I LOVE my job and teaching and the intellectual stimulation it provides. I don’t have dreams of ‘advancement’ – I would never want to be an administrator, so it wasn’t about feeling like I had to work or lose my place in the field. Teaching is one of those careers you can go in and out of (though with financial consequences). I took long maternity leaves (well, long by US standards) of about 10 months and 7 months with each of my children, and that was enough to let me know that I am NOT SAHM material. I am a much better mom when I am a working mom. I am fulfilled, and I feel we have a bit of the best of both worlds. Since my husband and I are both teachers, we have long winter and spring breaks, and wonderful summers when all 4 of us are home together. I also feel it is important for me to be using my education. Thank you, Sarah! If I had stayed in teaching, I do think that education can avoid a lot of these lean in/opt out questions. And you sort of get the best of both worlds, because you get summers off and to experience life as a SAHM and plenty of vacation time. And you’re right there’s less penalty for going in and out of the work force in education. I too knew that I didn’t want a career in administration. It’s funny though that during my teaching career, I’ve had mainly female principals and superintendents, nearly all of whom had been either single or childless. And I had conversations with several of them about the choices that they made in their educational careers. I think the media seizes upon the concepts of “opting out” or “leaning in” because it is an easy way for them to compartmentalize what for most women is extremely complicated. They become sound bites. For most women, it’s not either/or. I work full time outside the home, and I like my job. However, as I rush, rush, rush and feel guilty when my son says he wants to stay home instead of go to daycare, I wish I could opt out. At least for a little while. I wish it were easier to both lean in and opt out without major repercussions. Jessica, I want what you want exactly. I’m hoping to keep moving towards it. I have it in many ways though would love to bring in a bit more (like any) $$ at some point. I feel fulfilled with the writing and blogging, but I can only do such a thing because my husband is able to support us. I know that and appreciate it. By the way, I read all those pieces too . . . it seems like every woman interviewed had a big big career in 20s and most of 30s then stated home with kids and were new moms in their late 30s. There was not a lot of discussion of a mom like me who had kids a little earlier. Would be interesting to study that population too . . . people like me who are getting serious about our careers for the FIRST time in our mid-30s, not becoming new moms in mid 30s. Nina, that would be an interesting discussion too. Really interesting. Although I think that there would be a lot of overlap. I guess it would mainly depend on how “straight” your path was in your career track, if you switched careers, mainly. Oh boy. I have struggled with opting out for over ten years, and while the battle in my head has quieted, it’s still there. I went to school, got my Master’s, got married, had kids, and stopped working. I love being a stay at home mom, but I feel guilty about the mixed message I am giving my children, particularly my daughter. I can give myself enough guilt; the media just makes it worse. Really great post, Jessica! Well said, a great post! I also read the 2003 piece by Judith Warner and thought, as a recent grad just starting out with a career in engineering, that I would never opt-out because my career is important to me and I wanted to be a role model for other women and girls interested in math and science. Now, 10 years later as the mother of a 2.5 year old still working full-time as an engineer, I find myself wanting something different. Ideally it would be the “intellectually stimulating, respectably paying, advancement-permitting part-time work” Warner mentions in her recent article. But where does such a thing exist and how do I find it? I have reservations about dropping out altogether, but I do consider it from time to time. I am blessed that my family could afford to live without my income, so it’s an option. But one I’ve been too scared to take. I am planning to have another child and will likely reevaluate then. In general, it seems we, as Americans, put too much emphasis on working and hard work with long hours. I’d like to see all of us get a little more balance between life and work. If you asked me 10 years ago if I would be a SAHM, I would’ve laughed in your face. I wanted to BE SOMEONE, and I was doing really well with my career when I got pregnant. But once we had that first ultrasound, all of that stuff seemed irrelevant, and I knew in that moment that I wouldn’t be returning to work after my mat leave was over. I’d be lying if I said I don’t miss having an identity outside of being a mom and a wife, and that I don’t secretly want to put on a power suit and go to the office now and then to use my brain, but I don’t want to wake up 20 years from now regretting that I wasn’t around. So now I use my free time to try and figure out how to make a go of this blogging thing and turn it into some sort of business, and that is actually keeping my brain as occupied as I can handle with a 2 y/o running around. But check in with me when she goes to school, will ya? 😉 Great post! Jessica, really good article. I, too, was 100% convinced that I’d never leave the job that I loved to be a mom. I knew that I would be able to do both. In reality, I could do both, but I no longer want to. I didn’t quit my job until I was on maternity leave and realized how much time I was spending remaining engaged at work. My mind wasn’t in it, and everything I’d loved about it before (the high-pressure, high-intensity, long hours, sense of power, sense of leadership) were all things that I resented while replying to emails while my infant son slept next to me. I don’t regret my decision at all. My son just turned four and I only now went back to work part-time. It’s been a difficult adjustment because it turns out that 20-25 hours a week is a greater chunk of time than it sounds like to somebody who used to work 60-70 but I’m glad I did. Thanks so much for this – I feel less alone! Kristi Campbell recently posted…I have some bad habits. I, too, have felt the pulls to family and to career. I just couldn’t stand feeling guilt or regret any longer, so I have decided to embrace life as it is. Honestly, once I did I finally felt a simplicity I have longed for my entire life, even though I have 2 small kids and trying to finish a doctorate. I feel lucky I can live my life in this way because so many women cannot. Our culture is not family/women working friendly and we either have to accept it or fight like hell to change it. Jessica, cut yourself some slack because you are making such a contribution to the world via your blog all the while spending quality time with your son. I was just talking about you the other day with a friend in a similar situation as all of us. I told her how impressed I was that you have reinvented yourself within just a few months. Look at all you have accomplished just from the luxury of your own home. You have nothing to regret because I guarantee you will soon be dong interviews and writing a book where you are the expert (and getting paid!). Thank you, Wendy! I appreciate your encouragement so much. I’m so glad that you’re finding and embracing simplicity. Someday we’ll both be looking back on these days and be so grateful that we had such amazing opportunities. This subject is near and dear to my heart…I’m also opting out, but temporarily. Because my husband is also a teacher, I really have no choice but to go back to teaching full-time eventually. When my girls are both in school full-time, that’s a good time for me to return full-time, too. Like you, I’ve been lucky and managed to find stimulating part-time work, but I so identify with you when you say that what you want, truly, is to have an identity and a career, but not to be completely overwhelmed with professional responsibilities. If I could find that all the time, I would totally go for it. Our whole family’s quality of life improved when I started working part-time, rather than full-time, and I’m so nervous about how things will be when I go back to full-time employment. I enjoyed reading your post! I think so many of us are right there, too. I wish more part-time options (and part-time benefits) were out there!! Thank you, Jessica! Yes, that is the key, isn’t it? Finding a job and an employer that allows for flexibility, while also giving you the possibility of career advancement and responsibility. It’s tough, especially in this economy. What a lot of comments on this! 🙂 It’s a lively topic. What strikes me most is that the feelings of regret/worry/fear about these decisions comes from US — I put the fear of regret on MYSELF. We tend to blame culture/society/media/feminism/etc. for this niggling fear of letting go of anything we might later regret losing. But in the end, I must admit that it’s ME who demands to have my cake and eat it too. I want two lives, and I want them both in full. And that doesn’t happen. Neither life allows for it. I get, as a human, only One Full Life. Once I accepted that, and chose the better one, I was happier. I LOVE this idea: two selves, both living alternate lives. That is exactly what I’m feeling. Have you ever read the novel “The Post-Birthday World” by Lionel Shriver? I can’t even precisely remember the plot, but this is what it’s about. I remember that book! It was fascinating to see how her lives would have played out depending on certain choices she made. Maybe we do have that experience in parallel universes. Might be nice to have a wormhole to peek in and see what my other life is like. I am so thankful for the SITSsharefest do that I found this piece! Beautiful and honest! This resonates with me because I am returning full time to a career that I love, but with nerves and hesitation by being crushed by the high expectations. Honestly, I say that I would like more time to spend with my kids, but then I do and it drives me bonkers. I want to work outside the home. I want to interact with other professionals. I think it is a “grass is always greener on the other side of the fence” phenomenon with me. Stopping by from ShareFest; thanks for sharing! I always thought I would opt out. I took a year off to be with my kids after each was born (Canada’s mat leave:)), then planned on pulling out. Divorce changed everything for me and I found myself working full time. My biggest challenge was not even the guilt – which I certainly had. It was the judgment from other women. Somehow if you stay home, you love your kids more. I had to feel guilty for working even though I HAD to. Many women are in that situation. And if they are not? If they choose to work – they are made to feel even worse! I know lots of SAHM who spend their time having coffee with friends, decorating, going to yoga and NOT being with their kids. And many working Moms who drop everything to go to the school play, spend evenings making cookies for the class etc. The point is we are all individuals. What is important is we do what is right for our family , and for ourselves, and support each other in those choices. I am self employed – in private practice so I now work full time hours / but around my kid’s schedule. This is what works for me and my family. I love my family and they are my first priority alwayd but I find work fulfilling and the financial reward work for my family. Great post! That’s wonderful that you found this kind of schedule and this kind of fulfillment. And, you’re right! I love your point that the categories of SAHM and working mom do not at all define that mother’s or her family’s experience. So true! And I also appreciate your sharing about your divorce. It seems like for the women from the original opt-out group, it was divorce that had the strongest influence on their own experience of balancing work and family. Thanks for this great piece, Jessica. I have had a similar ongoing internal battle since I became a mother 18 years ago. I have realized that I feel better and more balanced when I am working part time, even if it is doing freelance writing or teaching a few yoga classes a week. I wish I could earn more money doing these things that I love and that provide me with the flexibility I have needed to care for my 4 children, but I have to admit that no matter what the amount is on the paycheck, I do get satisfaction just seeing my name on the payee line. I think the terms leaning in and opting out do sound “judgy.” Every mom needs to figure out what works best for her and her family without the fear of being judged. Unfortunately, I think many moms, myself included, feel both internal and external pressure to do the “right” thing…and who’s to say what that really is? Your marriage’s strength depends on the amount of time and effort you each put into it. If you refuse to allow the relationship to weaken, if you put effort into it every day, then it will stay as strong, or stronger, than it ever was. As important as your child(ren) is/are to you, your marriage should always come first, because eventually children grow up and move away, and you will be left staring into the face of a stranger without the buffer of your child holding you in the same location. Wow. The paragraph that starts “this is what I want” hit me like a boulder. That is exactly what I want as well. Yet it is as common to find as a four-leaf clover. Why is that? As someone who has opted-in and opt-ed out (and leaned waaaay in pre-baby), I never feel completely content. Why don’t motherhood and career overlap a little more? Why does it have to feel so all or nothing?